Our friends from the past, the link on the name takes you to the kennelclub database. We miss our nr 1 with a heart bigger than himself. Day before he left us we were in city walking and eating icecream. 12.5.04 morning he was throwing his toys, jumping and played just as Bamse. We are full of sorrow but try to think, he didn’t suffer. But still, it hurts so very very mutch. No one can give the amount of love as he could, and he had the joy of life like no other has, even in his latest moments. 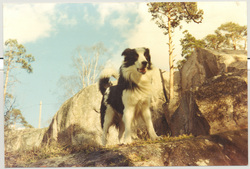 Bamse, the dog of my life. Competed in obedience open class. My first dog that learned me a lot. Not of the most easy temperament but an excellent educator and teacher into shows and training. I got him as an graduationpresent from my mom when I was 18 yrs old. The perfect example how you should never take a dog, But it was worth it, the reason was mainly for pity. We met him at a family scared in a corner looking for a new home. We did not think for a moment about it and took him home with us. 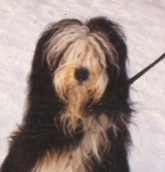 He had pedigree and papers of registered beardedcollie, but his look was something else, very beautiful tgough. He won several match shows (unoff. shows). He was very scared and paniqued and stressed easy. But when everything was fine, he was very lovable and ofcourse, his behaviour learned me a lot about living and learning with a dog like him. Our teddybear. The most charming gentleman, moved in with us as 10 years old when his owner had to move abroad and could not take him with her. He is now about 16 yrs old. Not just a bunny. 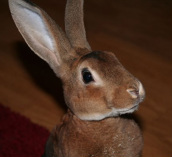 TOP personality of the breed Rex. No front teeth and skew jaw make's him look special. 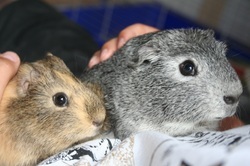 two qute guineapigs that passed out soon after each other. Very talkactive small guys.